Sour Cream Banana Bread is a sweet, moist bread with a crisp crust and a tender crumb. Spread with butter or sliced and eaten just as is, banana bread is a delightful and delicious quick bread that my whole family loves. I baked this recipe as muffins the first time I made it and we liked them so much that the muffins disappeared in 24 hours. My youngest begged for more after his nap this afternoon and that was all the excuse I needed to bake another batch. This recipe comes together in just minutes. If you choose to make muffins instead of a loaf, it will be in and out of the oven in under 20 minutes. A loaf takes just under an hour. Slathered with butter and still warm from the oven, this was a delicious treat that completely and totally ruined my appetite for dinner. I have no complaints about that. None at all. Sour cream is the secret to a moist and tender banana bread. The sour cream adds flavor and moisture keeping the bread or muffins from getting too dry, tough or crumbly on the inside. Got overly ripe bananas? This recipe is the most delicious way to use up those bananas that are going brown. The high sugar content and moisture of very ripe bananas will make your bread sweet and full of banana flavor. 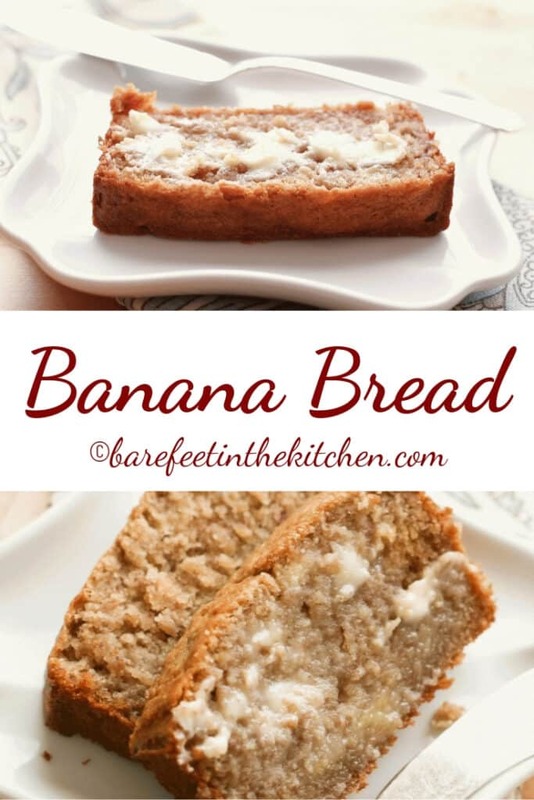 If you have more than a few bananas lying around you need to use, go ahead and make a couple loaves of this bread at ones (or a few batches of muffins). It freezes well and no one ever regretted having extra banana bread around! The crust of this bread is just slightly crispy and the contrast between the crisp crust and tender bite of the inside is heavenly. As far as bread recipes go, you can’t get much easier than banana bread! All of the ingredients are mixed together in just one bowl making clean-up a breeze. You’ll spend less time cleaning up and more time enjoying slice after slice of freshly baked banana bread warm from the oven. That sounds like a win to me! I use a hand mixer to beat ingredients together but you could certainly also use a stand mixer or mix the ingredients well by hand. Just make sure the butter, sugar and eggs are well creamed together. Another thing I love about this recipe is that it’s sweet but not TOO sweet. So you can serve it as an easy after-dinner dessert and then again for breakfast the next morning. Making this recipe as muffins means you can grab one with no fuss for a quick on-the-go breakfast on busy mornings. I also love a satisfying slice of lightly toasted banana bread so you really can’t go wrong any way you make it. In the event you somehow manage to not eat the entire loaf of Sour Cream Banana Bread in a day or two, the leftovers make amazing Banana Bread French Toast. I’ve made both the gluten free and regular versions of this banana bread recipe with sour cream. I get fantastic results with both versions each and every time. Everyone I’ve served this too has enjoyed the gluten free version which uses brown rice flour, tapioca starch and potato starch rather than traditional flour. If you don’t have these ingredients on hand or don’t want to make your bread gluten free you can easily substitute those ingredients for all-purpose flour. However you make this easy Sour Cream Banana Bread I know you’re bound to love it as much as I do! My fellow banana bread lovers will also enjoy Blueberry Coconut Banana Bread, Hawaiian Banana Bread , and Chocolate Chip Macadamia Nut Banana Bread, all of which have a place in my baking rotation. Irish Raisin Soda Bread and Chocolate Chip Pumpkin Bread are other marvelous quick breads my family goes absolutely wild for. A loaf of quick bread or batch of muffins is appropriate any day and anytime of year. Looking for more delicious breads, desserts, and baked goods that just happen to be gluten free? 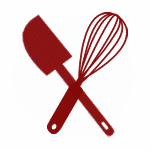 Check out Gluten Free Dessert Recipes on this website! Preheat the oven to 350 degrees. Lightly grease a 8 1/2” x 4 1/2” loaf pan or 12-18 muffin cups. Combine the butter and sugar in a mixing bowl and beat with a mixer until smooth. Add the vanilla and eggs and beat again until smooth. Slowly add the dry ingredients, beating just until combined. Stir in the bananas and sour cream and beat just until combined. Pour into the prepared pans or muffin tins. Sour Cream Banana Bread is a sweet, moist bread with a crisp crust and a tender crumb. Preheat the oven to 350 degrees. Lightly grease a 8 1/2” x 4 1/2” loaf pan or 12-18 muffin cups. Combine the butter and sugar in a mixing bowl and beat with a mixer until smooth. Add the vanilla and eggs and beat again until smooth. Slowly add the dry ingredients, beating just until combined. Stir in the bananas and sour cream and beat just until combined. Pour into the prepared pans or muffin tins. Bake the muffins for 18-20 minutes and bake a full size loaf for 55-60 minutes, until an inserted toothpick comes out with moist crumbs. Enjoy! This bread is awesome!!! Thanks for the recipe. I didn’t see the ingredients for regular (not GF) easy sour cream banana bread listed, only the instructions. Where are the ingredients?